Sometimes documentaries can act like homework. Dry, full of talking heads and mediocre cinematography all make certain documentaries feel like work even if you are intrigued or interested in the subject matter. Other documentaries take a dry news story and make a captivating movie out of it. The Square is a documentary that falls firmly in the latter category. 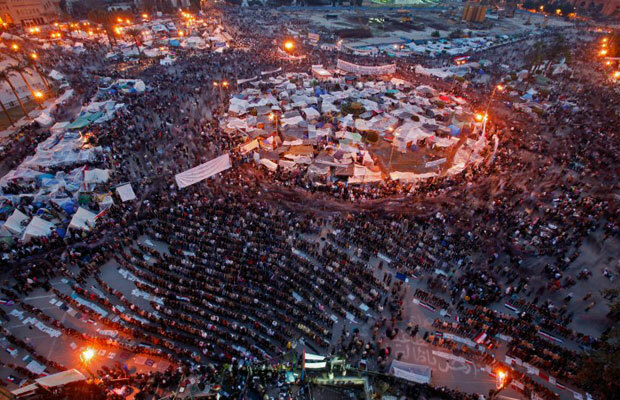 The Arab Spring started with the occupation of Cario, Egypt’s Tahrir Square in 2011. Upset with the current President, Mubarack, ordinary citizens of Egypt took to the streets in protest. The battle was epic and brutal, but it was won by the citizens. This is where the documentary starts. The night of Mubarack is removed from power, we see huge crowds of diverse people hugging, singing and talking about what a success the demonstrations were. We are introduced to several activists, all fervently involved in the organizing and education of the people. One man in particular, Ahmed Hassan, is particularly interesting. He joined the revolution because he was sick of working for nothing and not getting recognized as a true citizen of the country he grew up in. The film also follows Khalid Abdalla, an actor most famous for his role in the Kite Runner. Khalid uses his slight celebrity and the long tradition of activism in his family to stand up for the Egypt he believes in. We also watch several women talk about their experiences along with a man who belonged to the Muslim Brotherhood (I think he still does.) The first part of the documentary is filled with hope. That hope is soon dashed by what is about to happen. The Muslim Brotherhood, a vocal and strong section of the Egyptian population, takes credit for the protests and wins several governmental positions including the President when it comes to a vote. The problem with this is that the Muslim Brotherhood helped the enforcers, not the protesters. They weren’t even officially there (several members showed up but not because they represented the group.) The Egyptians basically replaced an amoral dictator with a religious one. Things were not getting better for the common citizen. In fact more restrictions were being proposed. The radicals we watch realize that they gave up the Square too soon. They must go back to the Square and protest again. Violence almost immediately breaks out resulting a few bloody months. These bloody months fueled the ordinary citizen to come out and protest, resulting in one of the biggest organized protests in history. Morsi, the religious President, was removed from power. Hope comes back to Egypt again. Everything I just said, you could have read in a couple of minutes if you have the right source. Unfortunately there are so many wrong sources that it is hard to really know what is going on there unless you are on the ground watching it day-to-day. For instance I had no idea that the Muslim Brotherhood wasn’t behind the initial protests. Almost every news piece in the United States had the Muslim Brotherhood as the organizer. This was and is most definitely not true. Throughout the film we watch a Muslim Brotherhood member get more disillusioned by the group that he was willing to die for a couple of years prior. He sees the oppression that his group is capable of and he is disappointed. He straddles two very different worlds. At one point he is confronted by the brutal fact that the religion he believes in is courting his son into more radical beliefs than even he has. The Muslim Brotherhood had called out to their congregation to punish the protesters. His son is caught throwing stones at the protesters at the explicit request of the group. He comes home and is cocky about his deeds. One of the father’s non-Muslim Brotherhood friends shows him a brutal video just taken a little while before he had went to throw rocks. People are beating up protesters with bats and throwing molotov cocktails at peaceful activists. He then asks him if he would throw a rock at him if he was there that night. The son is horrified by the actual events that he had been defending a moment before. The indoctrination of a whole swath of the population is fascinating and kind of scary to watch. But to see people rebel against that type of groupthink, like we see again and again throughout this film, is what gives me hope. The movie isn’t just about the events happening in Tahrir Square, but also about how it is being portrayed by artists, activists, reporters, and politicians. Throughout the whole film we watch an anonymous man paint these beautiful paintings that represent the chaos and the violence happening in Tahrir Square. At another point, a man who has become the singing voice of the protest is recalling what happened to him when he was taken into prison after one of his performances. We see the lashes on his back and hear his voice tremble as he discusses his trauma. But this capture does nothing to curb his constant ability to belt out a folk song to a crowd needing rousing. The art of these people is how they are able to cope and see the violence and the minute frustrations of everyday protests. This results in some really moving pictures and music. In fact this whole movie is an exercise in how the filmmaker sees the chaos around her.